By the time I reached the end of the Long Earth series, I had a revelation. With the bounding conditions of the universe being that there are multiple worlds accessible via stepping and that no iron can pass between worlds, the ideas to explore these multiple worlds are almost endless. My revelation was that this series would have been better as an anthology of short stories from a collection of authors, instead of a handful of semi-disjointed novels that didn’t ever quite know what they were doing. The story never shined through, instead of feeling like a distracted three-year-old who wants to explore the potential of other worlds. While I felt the series was starting to succeed in telling coherent and solid plots, this book removed that forward progress. When nearly one-third of the first part of the book seems to be comprised entirely of summary and recaps of the last four books, you know there’s not a lot of original ideas present in this one. And while minor tangents like the Johnny Shakespeare side-plot were amusing, they were loosely connected to the main plot at best. Even this main plot didn’t feel like it had enough time spent on it, as the main character of Joshua Valienté seemed to spend most of his time distracted on other worlds with unique trees instead of exploring the Long Cosmos that this book was supposed to be describing. Even though this book was released after Terry Pratchett’s death, it was clear he still had some of his influence on the plot and characters. Unfortunately, as was the case in the other books of the series, his contributions seemed to be fairly obvious, as they were the ones that didn’t quite fit in with everything else and just managed to be silly in an otherwise scientific exploration of new worlds. 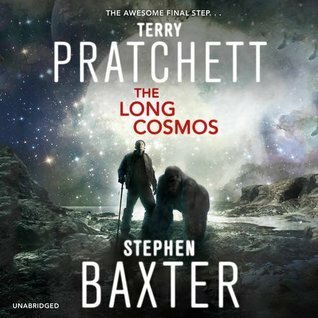 The final book in a series that should have been an anthology, I give The Long Cosmos 2.5 stars out of 5.